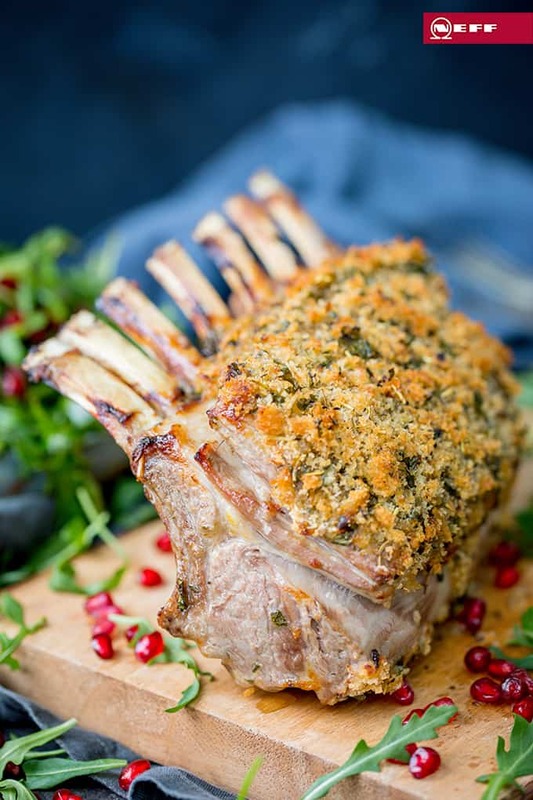 Juicy, tender rack of lamb with a honey-mustard-herb crust, all served up with a pomegranate and rocket salad. It makes a great dinner to impress – and it’s so quick to prepare! I think roast lamb might be my favourite meat for Sunday dinner. 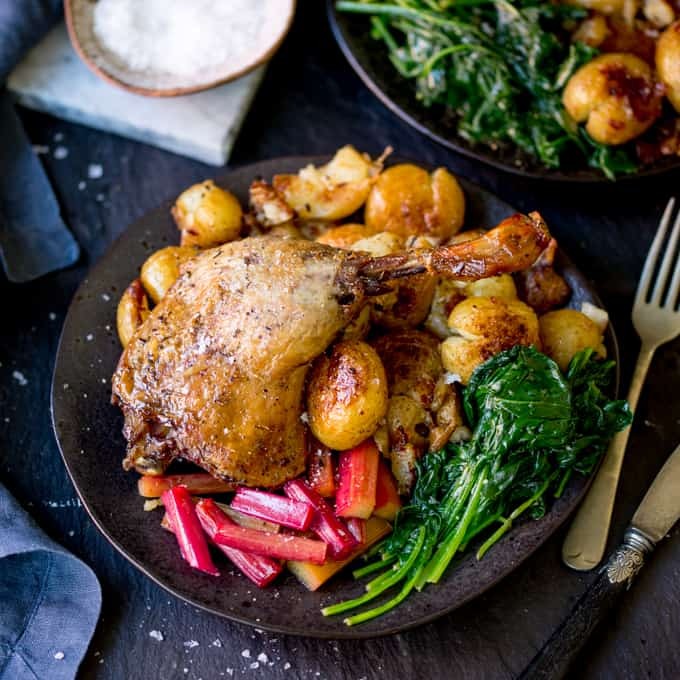 Cooked in the oven and served up with roast potatoes and mint sauce? But some days there just isn’t time to wait 2 hours for a joint of lamb to cook. And that’s where this recipe comes into play. 10 minutes prep, 25 minutes in the oven and done. It’s full of flavour, and looks just so darn pretty! I created it for NEFF back in March, and I’ve been dreaming of recreating it ever since! In case you guys didn’t know, I do lots of work with NEFF. I won their first cookaholics competition a couple of years ago, which resulted in me getting a whole kitchen full of appliances (you can see them in my kitchen reveal video), and I’ve been working with them ever since. I create lots of recipes for them, and I love testing out all of the functions of their ovens (they’re not paying me to say that btw!). Anyway, since I spend lots of time creating recipes and videos for NEFF (mostly for their Facebook page), I REALLY wanted to share some of those recipes with you! And they’ve kindly agreed to let me share on Kitchen Sanctuary. First up is this rack of lamb. 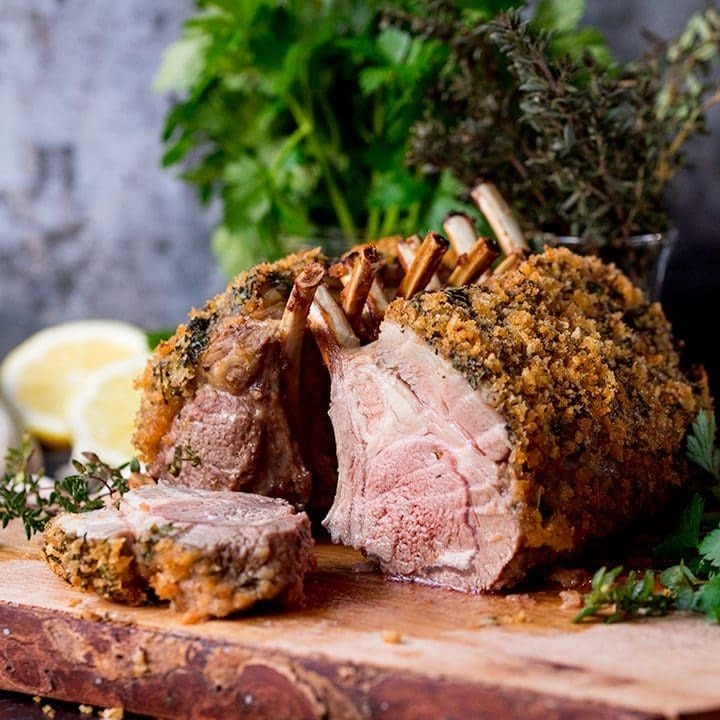 The lamb is first coated in a honey, mustard and herb sauce – which is kind of like the glue for the herby breadcrumb coating. 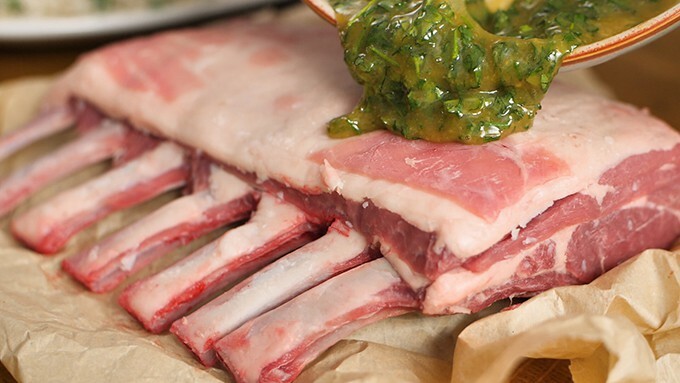 The lamb goes into the oven and cooks for about 20-25 minutes, until the internal temperature reaches 60C/140F. If you check out the video, you can see I’m using a meat thermometer for this (which stays in the meat during cooking – as the oven will tell you when the correct temperature is reached). You can use a regular meat thermometer too – checking after 20 minutes, then again at 25 minutes if needed. I also use added steam, to ensure the meat is ultra moist. 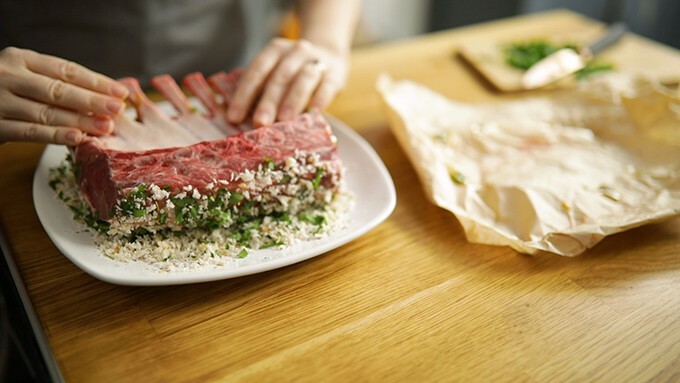 Don’t worry if you don’t have a steam oven, just make sure you rest the lamb (covered) for 15-20 minutes before serving and it will still be delicious. Serve with this simple rocket and pomegranate salad with a light balsamic dressing. 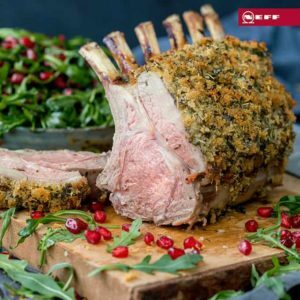 Juicy, tender rack of lamb with a honey-mustard-herb crust, all served up with a pomegranate and rocket salad. It makes a great dinner to impress - and it's so quick to prepare! Preheat the oven to 200C/400F (if you have a Neff oven, heat using CircoTherm 180C). Mix together the honey, mustard, 1 tbsp of the olive oil and 2 tbsp of the parsley on a plate. 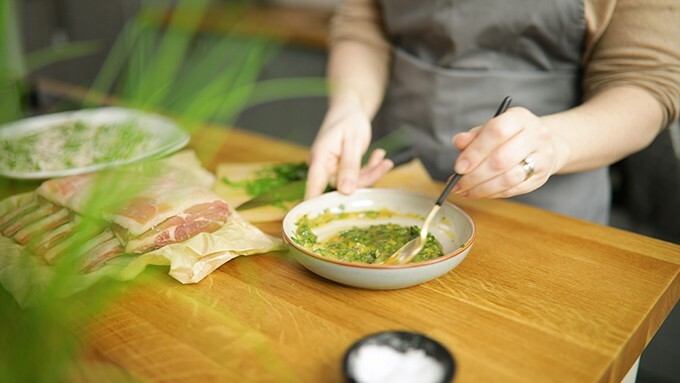 Mix together the bread crumbs, dried herbs, salt, pepper and the remaining 1 tbsp of parsley on another plate. 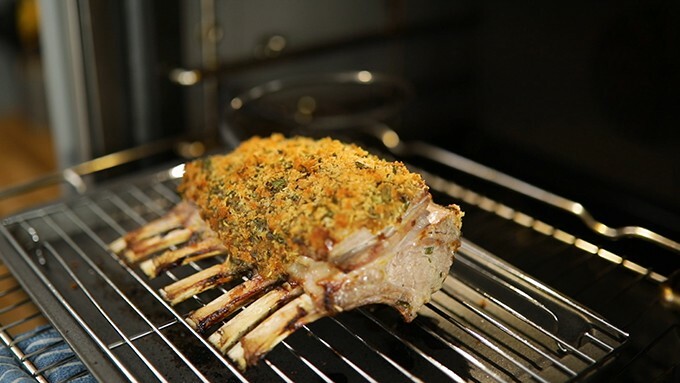 Coat the rack of lamb with the honey and mustard mix then coat in the herby bread crumb mixture. Drizzle on the remaining 1 tbsp of olive oil. Cook for 20-25 minutes until browned on the outside and pink in the middle. 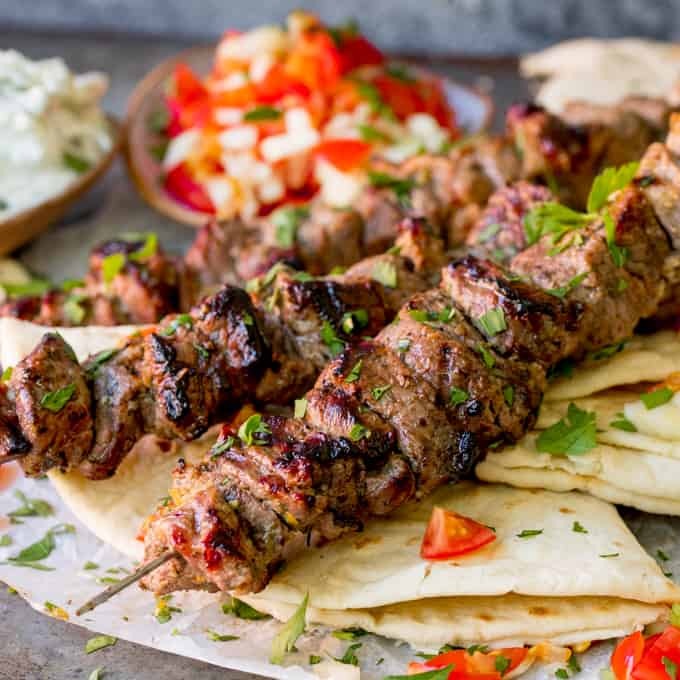 If you have a meat thermometer, the internal temperature should be 60C/140C for medium-pink lamb (the temperature will rise a little more during resting). Meanwhile make the salad. 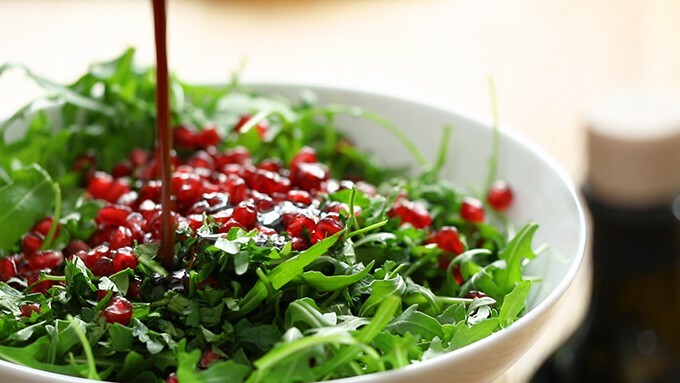 Place the rocket, parsley, mint, chives and pomegranate into a large bowl and toss together. 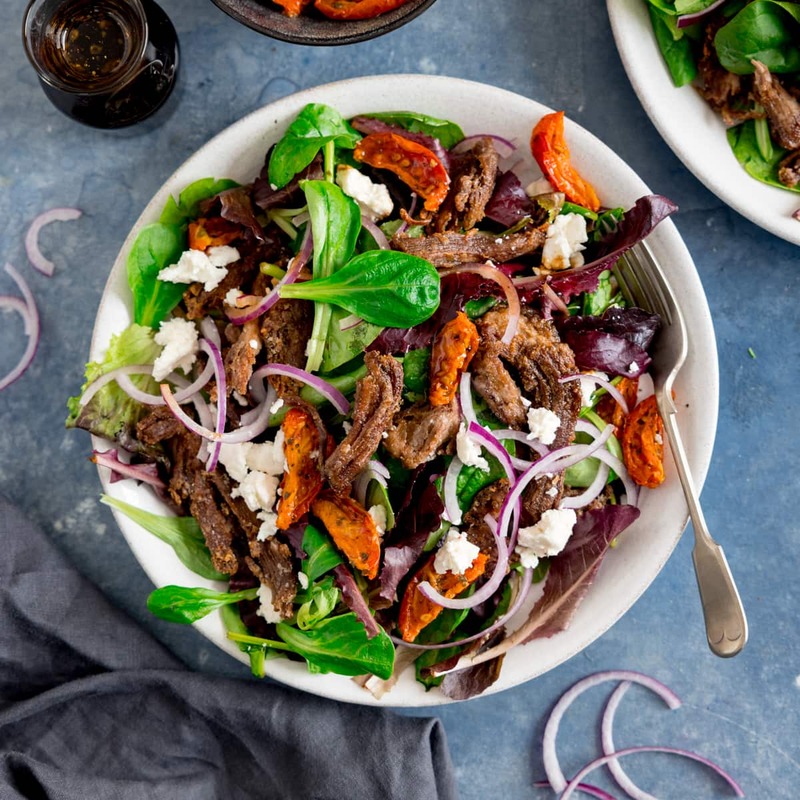 Mix together the olive oil, balsamic vinegar, salt and pepper and drizzle over the salad. Toss together again to coat the leaves. When the lamb is ready, remove from oven and allow to rest, covered with foil for 15 minutes (or 10 minutes if you cooked with steam). Then carve into slices. Divide the slices between 3 plates and serve with the rocket salad. Nutritional Information is per serving - for two lamb cutlets with salad. 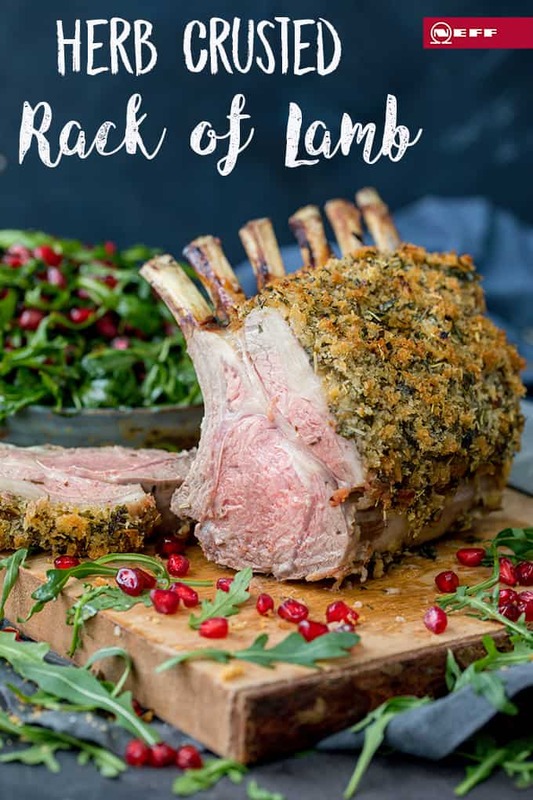 We just love rack of lamb, in fact most any lamb. . Unfortunately we would have to mortgage our home to buy it !! Enjoy, whilst you can.